I know you’ve been waiting anxiously for this, so here’s the finale of the homemade jerky extravaganza!!! So you’ve marinated your beef overnight and it’s getting nice and flavorful. 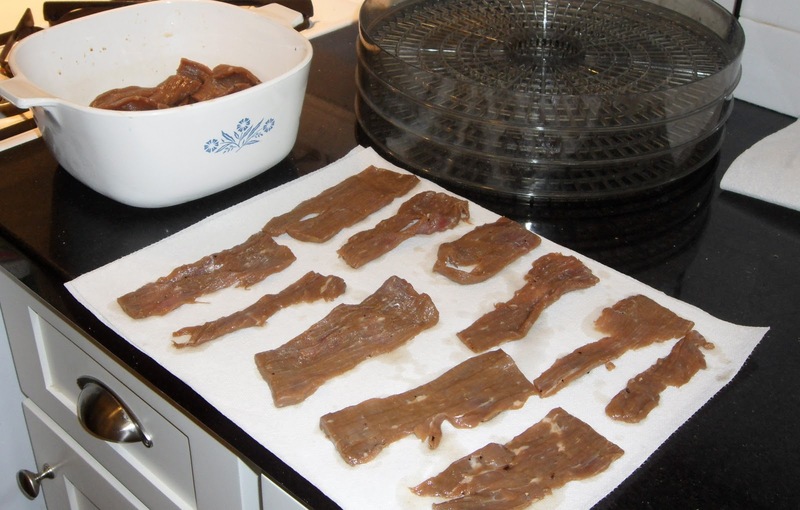 The jerky you see below marinated overnight before I drained it and made the final prep for the dehydrator. Drain the beef thoroughly and remove any remaining moisture by placing the individual pieces on a double thick paper towel. I lay mine out in rows and then roll them up so the paper towel pulls off the moisture on both sides. Feel free to press firmly with your hands when you roll, beef can take a little man-handling. The surface of each piece should feel pretty dry to the touch once you’ve patted it down via the paper towel method. The surface should also look dry and no liquid should be welling up. Place the pieces in an evenly on a rack of your dehydrator. 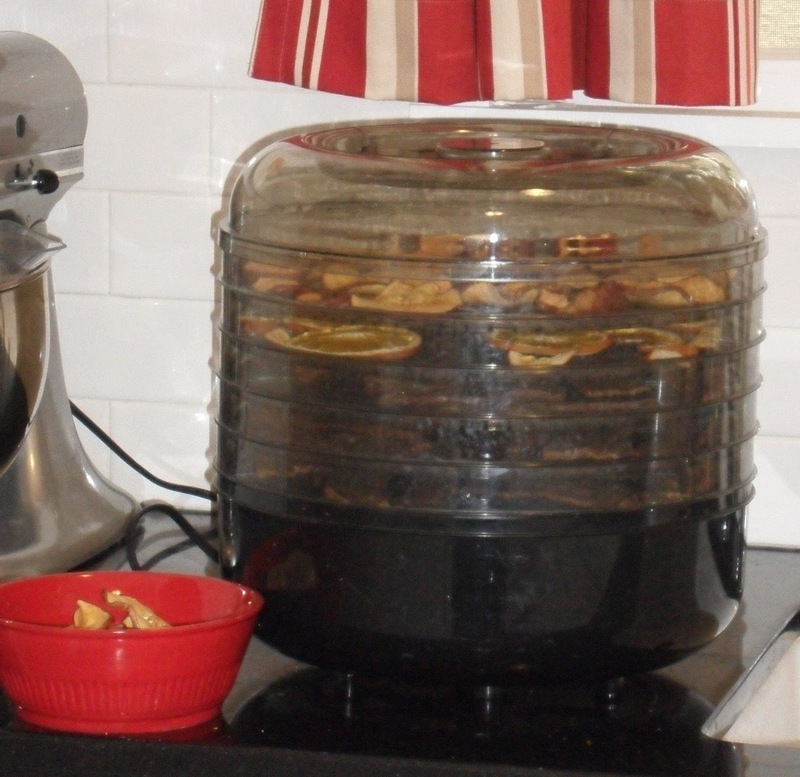 Once you’re dried every piece thoroughly and loaded your dehydrator, it’s time to get cooking. Well, not cooking, we’re drying! Now, my dehydrator only goes on and off so the way to regulate temperature is by opening or closing vents on the top and bottom. I leave my vents at half and half so that most of the heat from the coil in the bottom is retained, but there’s still space for moisture to vent. 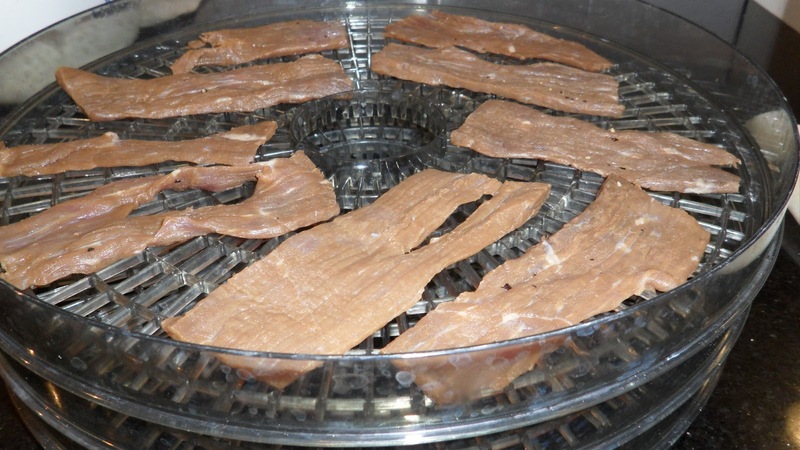 I highly recommend you consult the manual for your dehydrator before determining the temperature and duration for drying your jerky as it can vary greatly. Vents half-open, I left my jerky for about 6 hours before checking it. The great thing about using a consistently low temperature dehydrator is you don’t have to worry about the temperature or moisture level changing as long as you leave it alone. There are recipes for using an oven at 200 degrees but honestly I think that’s too high to achieve great jerky results. It cooks faster than it dries and it’s easier to burn as a result. After 6 hours most of my jerky was done to perfection. About a third of the thicker pieces still needed some time, so I left them in for a few more hours. When you’re not sure about how long your jerky will take, just check it every hour or do and do a doneness* test. Here’s a pic of some of my finished jerky. Overall I spent about $5 on my jerky meat and got about one and half times the amount of meat in a typical $7 – $10 bag of store bought jerky. Hands on time was probably 25 minutes overall, as most of the work is inactive while it marinates and then dries. 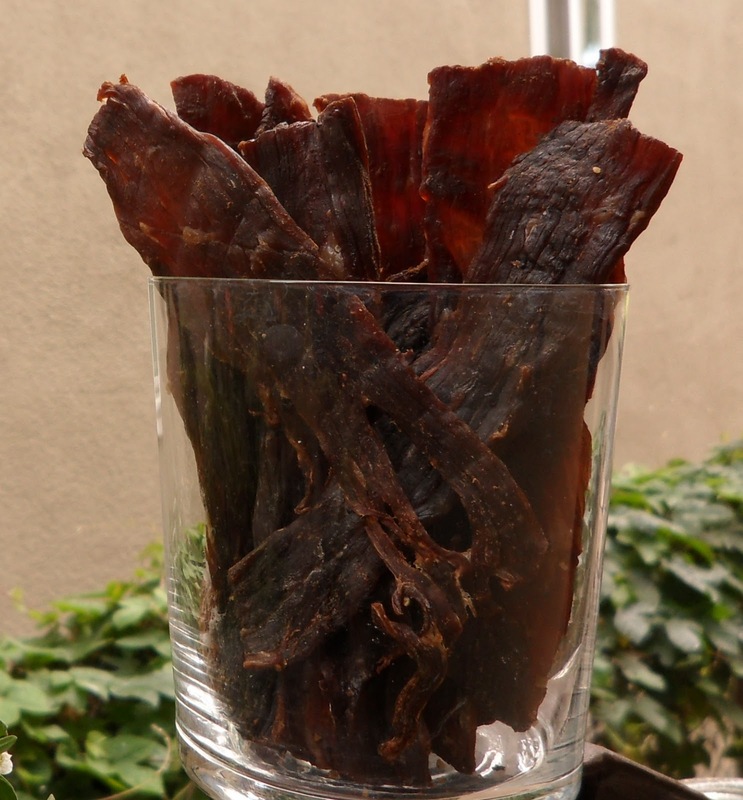 I thoroughly recommend investing in a dehydrator and trying out this yummy jerky recipe. Your friends will think you’re so cool. *NOTE: In case you were wondering (as I was) if “doneness” is a word, check out my new favorite website isthisaword.com.